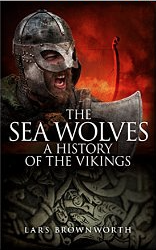 Sean asks which of the Vikings was most interesting and why. This is one of those ‘moving target’ questions that will have a different answer each time it’s asked. I’ll arbitrarily limit myself three (or else we’ll be here all day). Part of the fun of writing a book is meeting characters who are radically different than anyone you’re likely to meet here in the 21st century. And the first character who really leapt off the page for me was the much romanticized – but little known – Ragnar Lothbrok. From the dubious legends (inventing a pair of pants that protected him from snake bites, meeting his gorgeous wife Aslaug who proved his equal in cunning, and his death at the hands of a furious English King) to his much chronicled sack of Paris, this was a man who fully lived out the Viking creed that man may be mortal, but reputations live forever. The second figure has to be Aud the Deep-Minded. She was the wife of the Viking king of Dublin, who was widowed at a relatively young age. Rather than marry again, she took her son to the Hebrides and helped him conquer half of Scotland. When he too was killed, the redoubtable Aud sailed to Iceland – commanding a crew of twenty Vikings – and claimed a large plot of land. In an age dominated by men, Aud ruled as a clan chief, settling disputes, granting favors, and throwing celebrated feasts. When she died two decades later she was given a full Viking Ship funeral, the only recorded woman ever to be honored with one. Finally, I have to include the terrible Harald Hårdrada. No single figure better represents the entire Viking Age. He was probably pagan, but was the half brother of Norway’s patron saint. He spent time raiding in France, but made his reputation – and a tremendous amount of money – in the east by protecting Byzantine Emperors in the celebrated Varangian Guard. After proving both his cunning and valor on the battlefield, he returned home and seized the throne of Norway, but true to his restless spirit, he spent most of his time trying to conquer additional territory. His story concluded fittingly with a bloody invasion of England. He died – as all Vikings should – with his armor on, and his battle axe swinging. Hollywood really has nothing on this.